The first two years of life are critical for the development of food preferences and eating behaviours that shape children’s dietary patterns and can have serious implications for the development of overweight and obesity later in life. 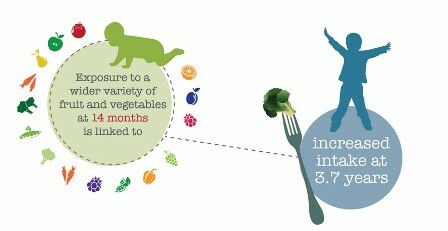 During infancy, a child is a depletion-driven eater, who consumes only milk and has no desire for other foods. As the child grows, he or she develops a physiologic need for more nutrients and transitions to solid foods. This is followed by a new stage the when the child attempts to assert his or her independence and to establish some sense of autonomy. Neophobia, a fear of new foods, usually peaks between the age of two and six and often results in the rejection of new foods, particularly vegetables. Highly neophobic children tend to have a lower preference for and consumption of fruit and vegetables, however they have a similar intake of noncore foods such as those high in sugar and fat compared to less neophobic children. Children typically show a stronger neophobic response to vegetables that are less sweet and are therefore less liked than fruit and noncore foods. Neophobia is a normal part of development but often leads to frustration, anxiety and power struggles between the parent and child. 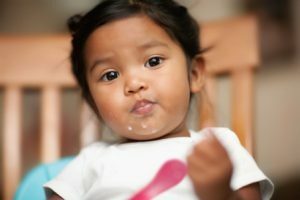 There is strong evidence to suggest that both the type and variety of foods a child is exposed to by the end of the first year of life will predict their food preferences and dietary quality later in childhood. For example, exposure to a wider variety of fruit and vegetables at 14 months is linked to an increased intake at 3.7 years (Fildes, 2015). Similarly, exposure to noncore foods at 14 months was linked to a greater liking of these foods at 3.7 years (Mallan, 2015). 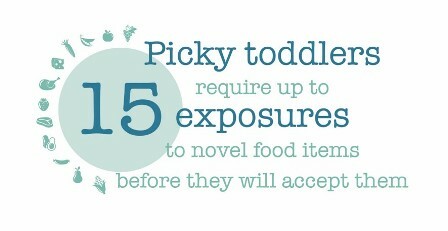 Picky toddlers require up to 15 exposures to novel food items before they will accept them (Lam, 2015). 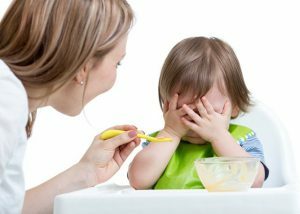 Literature supports the idea that picky eating is a developmental process for toddlers. Johnson (2002) described food acceptance patterns and the emergence of eating patterns in relation to physiologic growth, age, and emotional development. Toddlers are in nately programmed to be a bit sceptical of unfamiliar foods and this is what causes them to demonstrate picky eating habits for a period of time (Martins, 2002). Products targeting toddlers need to take this into account. Toddlers want autonomy, while parents are looking for healthy food and beverage products with tastes and textures that their toddler enjoys. Studies suggest that a wide variety of flavours, especially vegetable flavours need to be offered at all stages of weaning and toddlerhood, to increase their acceptance later in life. Weaning foods need to encompass a wide variety of foods, tastes and flavours, and should be gradually introduced to the child, increasing their exposure and thereby their acceptance. Early adoption of variety of foods in the diet can have long-term impact on dietary eating patterns of children, their overall health and nutritional outcomes.